A delicious homemade pizza base made with wholegrain spelt with some extra fibre. Healthier fakeaways. Sunday night is usually pizza night, we like routine. Pizza washed down with a glass of wine (or two) is a ritual end to the weekend. If we have been away for the weekend we do get the occasional delivery, but will often make our own. Pizza dough is easy to make, and making your own is far more frugal than a delivery. 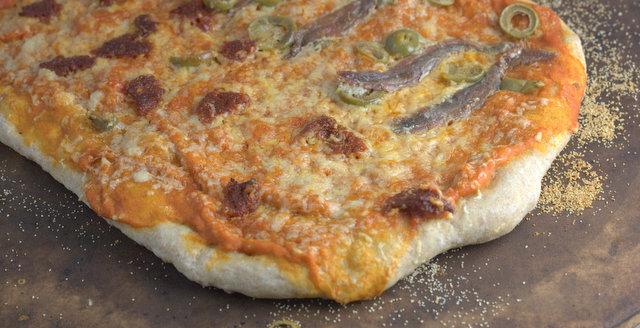 Also, you can pick the exact toppings you want and arrange them to accommodate all tastes and preferences (anchovies and capers are both more essential to my life than they are to others). I have only recently realised that there are two types of dried yeast, some need to be activated in water before adding to the flour. Check the packet to see which you have. I added spelt porridge flakes to the dough for some extra texture. Feel free to leave out. If you try this Recipe: Higher Fibre Spelt Pizza please tag #FussFreeFlavours on Instagram or Twitter. It is amazing for me when for me when you make one of my recipes and I really do love to see them. You can also share it on my Facebook page. Please pin this recipe to Pinterest too! Thanks for reading Fuss Free Flavours! Polenta & your choice of pizza toppings. Pour the water into bowl, add the yeast and swirl until it is dissolved, leave for 5 mins if needed to activate it. Add the other ingredients. Cover with cling film and leave in a warm place for a few hours. It should more than double in size. Turn out onto a floured board of worktop and gently knock the dough back. Divide the dough into 3. Gently shape each quantity of dough into a pizza shapes on a baking tray or pizza stone liberally sprinkled with polenta to stop sticking. 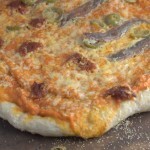 Spread with tomato sauce (I used my high fibre tomato and lentil sauce), arrange your toppings and sprinkle with cheese. Bake in a very hot oven (GM7 / 220c / 425F) for about 12 minutes until the cheese is bubbling and the pizza is golden around the edges.